The lobster was buttered with coconut oil, but you can use grass fed or clarified butter if you prefer. First, if you havenâ€™t baked your squash, set your oven to 400Â°F. Poke holes around the squash using a knife and place on a lined baking sheet before transferring into the oven. Bake for 30 minutes. Next, switch your oven settings to broil. Remove the clear shell covering the meaty part of the lobster tail. I find that kitchen scissors are most efficient with getting it out. Next mix melted coconut oil, garlic powder and sea salt in a cup and brush the exposed part of the lobster with it. Place in the oven on a lined baking sheet with the meaty part facing up. Broil for 5-7 minutes or until bubbly and cooked. Meanwhile, place a skillet over medium heat and grease with a dash of coconut oil. Place squash pasta in the skillet and sautÃ© with onions, tomatoes, and Mrs Dash. Let it sautÃ© for about 1 minute until the flavours are well blended in. 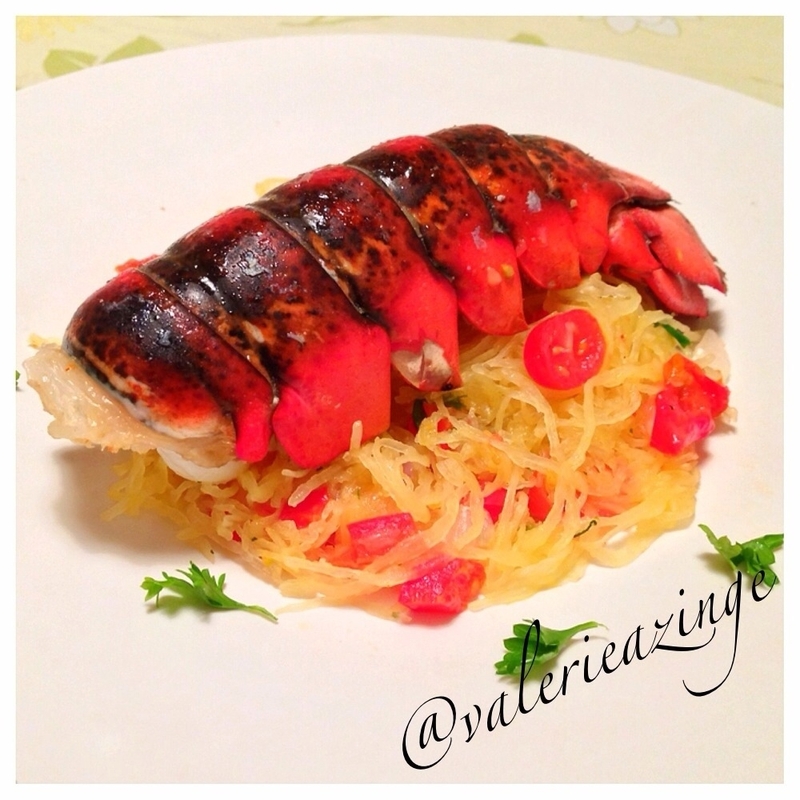 When ready, plate your spaghetti squash and top with the lobster tail. You will never miss lobster lunches again!